Kos Island is located in the Cyclades Islands and has a long history that dates back to ancient times. During the Middle Ages, it was a first line of defense against the invading Ottoman Empire, where the main role was played by Order of the Knights of St. John. Today, the island is one of the most popular tourist destinations in Greece and has beautiful beaches, crystal clear water and luxurious resorts. Many parts of the island of Kos are virtually untouched so that you'll find plenty of small hidden coves and magical wild beaches. 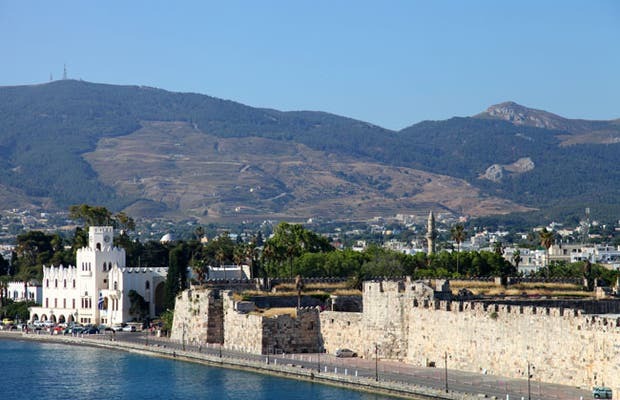 Kos Town is the main port and political and cultural center of the island. The city is full of whitewashed buildings and many hotels, restaurants, and night clubs along Kos' famous 'Bar Street'. The town has a 14th century fortress at the entrance to the harbor that was built by The Knights of Saint John of Rhodes. The ancient physician Hippocrates is thought to have been born on Kos and the 'Tree of Hippocrates', an area where the physician is traditionally supposed to have taught, is located in the center of town.